This was it! The morning of the marathon came and I was ready! In reality, I was partially ready since I had been training for a marathon that was weeks after Dubai and decided to do Dubai less than 4 weeks before the event. I signed up for this to do as blog research event, so I knew I wouldn’t be as well trained as I would have liked to be for a planned marathon, but I was still really excited about it! This race was very special since I got to run in the footsteps of the best runners in our sport. In fact, this year’s marathon saw the first time that 5 runners went under 2:05 in the marathon! That is just unbelievable! Ethiopia did a sweep of the board in both the male and female columns. The men’s winning time was 2:04:45 and the next 4 men coming in within 14 seconds of that! The women’s winning time was 2:23:23. It was great to be on the course for such a historical race! The Dubai Marathon is well-known for many reasons. One, is that it is the richest marathon in the world (of course!) with the biggest prize purse totaling over $1 million! For years, they have had a bonus for the runner who set the world record on the course – the bonus was $1 million! This year, they dropped it to $100,000 (even though they have never had to pay it out before). This year, they were going to have an A-list of marathoners and it was somewhat of an out-and-back course, so I was really looking forward to seeing these guys run. The second reason it is well-known is that it is run in Dubai’s winter on a flat course so it normally perfect conditions. I woke up early on race morning (like usual) and headed downstairs to catch a cab. It was just a bit after 6am and I grabbed a cab about 10 seconds after stepping out the door. It took us just about 5 minutes to get the Dubai Mall (where the start would be) and cost around $1! The problem with the drop zone is that it was still a really long walk to the starting line. Another problem had been that I had forgotten to grab anything the night before for breakfast, so I needed to find something someplace to eat. It was funny talking to some of the locals who were running the race and seeing them shiver in the frigid 59 degree weather. 🙂 Being from Western NY, this felt great in January! I was really surprised that there were fewer than 50 runners at the starting line around 1 hour before the race. I did find a road stand that was open and grabbed some granola bars. The good thing about having so few runners there was that there was no line for the bathrooms, which can always be a problem at the starting line of a marathon! Race time came closer and fog started to settle in. With the fog came humidity which is something that I do not handle well. I can run in the heat (Death Valley), I can run in the snow and winter (Beast of Burden) but the humidity just really takes its toll on me. I did not have a time goal for this race as I just wanted to check out the race and review it for you all. To help with that, I wore a GoPro camera to take video during the race. It wasn’t an ideal mounting situation, but I was able to get some good footage throughout the race. One thing to get used at international marathons is that any running event taking place as part of the whole running festival is called a marathon. So, when you are talking to people, they all tell you they are running the marathon, but they may mean they are running the 10k marathon or the 5k marathon. So races like this will claim that 20,000 runners ran in the marathon, but that is including all events. For Dubai, they had the full marathon, the 10K, and the 3K (as well as wheelchair events). 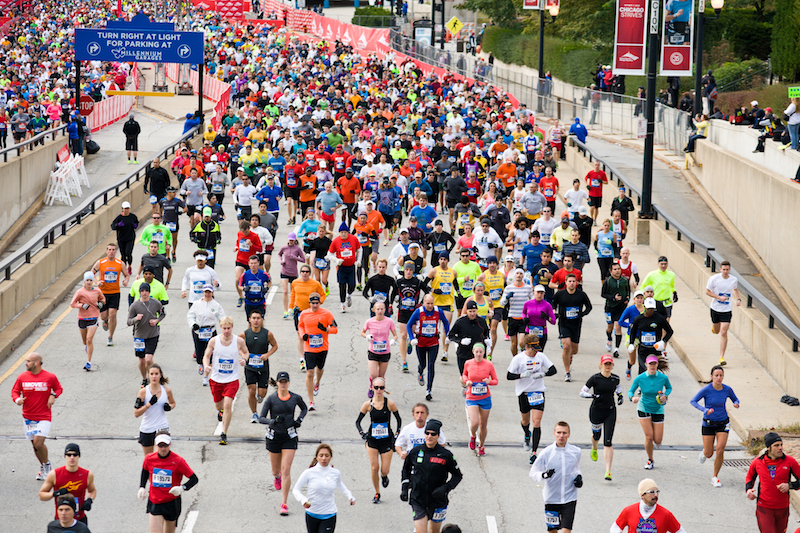 There were 2411 marathon finishers for 2013. A marathon in the US of 2400 runners would not look the same as this one did. There is a ton of fanfare and media coverage, mostly because of all the elite runners present. In one of the rarest marathons I have ever participated in, the race started promptly at 7AM. Check out the fog at the starting line! With cheers and horns, we were off. The fog was still heavy, but the sun had come up a little bit and that helped as we headed down the road. The route for the marathon heads down towards the water and then takes a turn to the main road that runs parallel with Sheikh Zayed Road. If the fog hadn’t been there, it would have been possible to see some of the really beautiful sights of Dubai. Unfortunately, that was not meant to be on this day. It was so foggy that it was hard to see even 100 feet in front of you at some points. The fog did not really burn off until after mile 18 or so, so that was really disappointing. Mile 1 – 8:30 Since there was no time goal in my mind, I just went out purposely slower than I would in a normal marathon and enjoyed the crowds (including the green men!). Mile 3 – 7:56 I was starting to feel the humidity a little bit more and starting to look for a bathroom! Mile 5 – 7:53 Mile 5 was the start of no elevation gain for 17 miles! Mile 7 – 8:06 At this point, I was really starting to suffer from the humidity. I no longer felt great and knew it was going to be a struggle over the next few miles to stay around the same pace. Mile 8 – 8:28 Have you ever not had (but really did have) a goal for a race? This was kind of how it was. I knew I should be able to do 3:3X no problem, even though I was going to do a little video and photos. But when I started feeling the effects of the humidity this early in the race, I knew that was not going to happen. So, I just kept looking for some good stuff to take photos of, but the fog still kept that from happening. Mile 9 – 8:06 Around this time, I started doing the math in my head about when I might be able to see the leaders on their way back to the start. I was really looking forward to that and wanted to get some video of them as they went by. I was thinking it would probably be in another 15 minutes or so. Mile 11 – 8:27 This was the mile where I saw them coming. It was really cool to see how fast and smooth they were! A pretty big lead pack around mile 17! Mile 12 – 8:21 It is really helpful to see such fast runners and you begin to feel like you can go faster as well – of course, my faster is almost 4 minutes per mile slower than what they were just doing! Mile 13 – 8:10 The turnaround was really around mile 13.5 so that helps to think that when you make the turn you are more than half over! Mile 15 – 8:40 Still had a lot of pain and at this point was really forgetting to do much in the way of videos, memories, photos, etc. I was just thinking about getting it over with. Mile 17 – 8:58 The fog was really starting to burn off now which meant the humidity was going down but it was getting hotter and my water intake was starting to really pick up (like refilling my bottle every 2 miles). Mile 18 – 10:17 WHAT?! I wasn’t even really thinking about pace much anymore so was walking for half a mile and then running the rest of it. Walking hurt a bit but the running hurt a lot more. Mile 20 – 10:23 Up until this point, there was not really a lot of spectators but as we started to come back into the downtown area, the crowds were a little thicker and that definitely helped us out. Mile 21 – 11:38 We could see the Burj Khalifa now which makes you think you are closer to the finish line than you really are! It was really cool to run around such buildings! Mile 22 – 11:31 This point to the end was a lot walking because of the pain. I was just going to be happy to finish now! I have never not finished a marathon and wasn’t going to start now. The only time that I had to meet was to get back to the hotel fast enough to make sure I didn’t miss my limo to the airport. As long as I made it back for that, it would be ok! Mile 23 – 12:30 It was really neat to check out the city from the ground and see the different buildings and companies represented. A lot of construction is around as they continue to build, build, build! Mile 25 – 13:10 We were really back into the city now and were getting to see a lot more people and buildings. From the streets of Dubai, that is basically what there is – buildings! They are really amazing to see, I just wish the whole race had been fog-free so that we could have enjoyed it more. One thing that surprised me at this point was the amount of runners that were walking. Normally, you see people walking at this point but not as many as I saw. I think the weather had taken its toll on many. Mile 26 – 11:43 Again, at this point in a marathon, I am picking up the pace quite a bit so that I can leave it all out there. Believe it or not, because of my foot, I was really leaving it all out even though the pace didn’t really reflect that. Mile 26.2 – 3:57 I think this was the slowest .2 I have ever run in a marathon. I was just so happy to finish! Total – 4 hours and 10 minutes This is about 40 minutes slower than my fastest marathon but one that I was still proud to finish since it took a lot of strength (maybe stupidity) to finish it. I came in 890 out of 2400 runners, so still not that bad! Ok, what did I think about the race overall? They had plenty of bathrooms at the start! Very good! It went very smoothly after crossing. It is a great marathon. There are some things that I note as being different or lacking but that is mostly due to our being spoiled by marathons in the US. I realize that not all marathons are done the same way as in the US and I allow for that. Would I do this race again? Absolutely (especially since I have some unfinished business)! I would spend more time here than one day, however. This race lived up to my expectations and I only wish I had not been hurting that much so I could have enjoyed it more. If you do this, you will not regret it! It is a nice international marathon to do since it is well-organized and is a smaller crowd than the big marathons of London, Berlin, and Paris, etc. Besides, there is one other element that you get with this marathon. You will have run a marathon in Dubai – that has a lot of cool factor built-in! There will be a video of the marathon coming soon! I am just reading your site now – great stuff! It sounds like you will be running it again this year? Hopefully, we will “run” into each other. I am arriving late Wednesday and leaving Saturday morning.